What is RTS,S or Mosquirix, the First Ever Malaria Vaccine Launched Ahead of World Malaria Day 2019? Manmadhudhu 2 is inspired by the 2002 released Telugu rom-com Manmadhudhu starring Nagarjuna Akkineni, Sonali Bendre and Anshu in the lead. The film turned out to be one of the biggest hits of Nagarjuna’s career. Manmadhudhu 2 is said to be a fun-filled film and Rakul Preet Singh has been roped in as the lead actress and pictures from the movie’s launch has gone viral. Rakul Preet QUITS Venky Mama for Akkineni Nagarjuna’s Manmadhudu 2? Rakul Preet Singh who is excited to be on-board for Manmadhudhu 2 tweeted, “Super duper excited to be on board for #Manmadhudu2 .. thankuuu @23_rahulr for giving me such a killer spunky fun role .. can’t wait to start shooting @iamnagarjuna”. The cast and crew came together for the launch at the Annapurna Studios in Hyderabad. Amala Akkineni and Naga Chaitanya were also present for the event. De De Pyaar De First Look: Ajay Devgn, Tabu and Rakul Preet Are All Set to take You on a Ride on May 17! The film will be directed by Rahul Ravindran and the music of Manmadhudhu 2 will be composed by RX 100 fame Chaitan Bharadwaj. 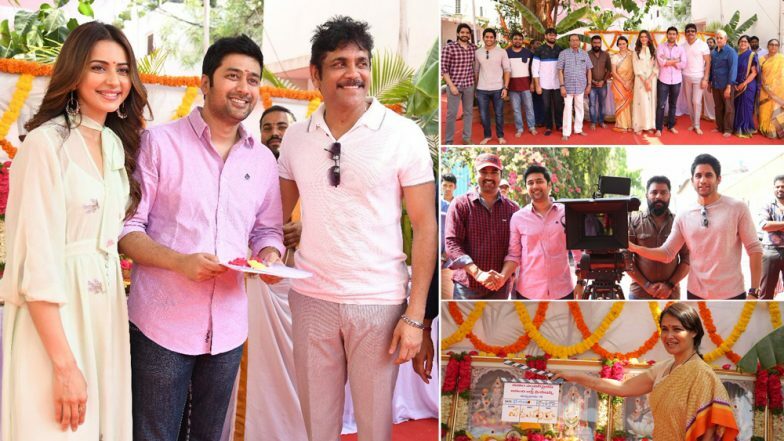 The film would jointly be produced by Nagarjuna and P. Kiran under the banners of Manam Enterprises and Anandi Arts Creations. For those who don’t know, Manmadhudhu was remade in Kannada in which Deepika Padukone was roped in as the lead actress, marking her debut in South Indian cinema. Avengers: EndGame vs Game of Thrones: 8 Similarities We Found Between the Two of the Biggest Fan-Favourite Events of 2019!